Don't think I even got 15k out of them. All wore evenly until left front blew out at 40 mph. Obviously not the best in deep snow or mud but tire did surprise me on trails of hard terrain and light mud. Great tire. Quiet. Good wearing resistance. Not too bad of a tire. I only have 2000 miles on them so far but love the handling and looks. They have a beefy look without the road noise. I look forward to seeing how they handle in the snow. Excellent tire. Likes the dirt more than the road. Very stable. These tires did perform well on my truck, but they wore down quickly. I only got 55,000 miles out of them. My wife and I picked the BFG Rugged Terrain tires because we love two tracking in Michigan and Wisconsin. These tries have a great, bold off road look that we love on our Jeep. 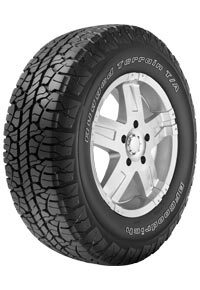 We would recommend these tires to anyone looking for a reliable off road / highway tire. BECAUSE I HAVE A 2007 FORD EXPLORER SPORT TRAC, I HAVE BFGOODRICH ALL TERRAIN TA WHITE LETTERS. I LOVE THESE TIRES. I NEED TWO NEW TIRES ON MY F250 HD PICK UP BADLY AND I THINK THESE TIRES ARE GOING TO HELP ME OUT VERY MUCH. SO I HOPE THAT I CAN WIN THE PAIR OF 4 BFGOODRICH TIRES FROM YOU GUYS. THANKS VERY MUCH. Got about 60000 miles out of them. Great job on the road, and not too bad in the mud. They wore great, and never had any problems. For what I want to do, though, I need something a little more aggressive. Great tires! I was worried about finding a good balance between knobby, biting tread vs. road noise at highway speeds, but the guys at the shop said they'd heard from other customers that these tires had very tolerable hum or whine. I trusted them and was not disappointed! So happy and relieved!! Good tires. Can't say much about the snow though as I live in South Carolina. Really good tire - am buying it again. The best tires I have had on my car. I had to sell the car but I recommend these tires. I have a heavy foot and these tires can handle every bit of it. I've run through two sets so far and already purchased number 3. Great, long lasting tire for just about any condition. Remarkably quiet on the highway, while still providing good traction for the snow/mud. Would not recommend these tires when vehicle use is primarily city and highway in 4 season climate. Hard rubber. Useless on ice and snow and also on wet pavement. Trading in on a set of Wild Country xtx sport. I regret buying them. Satisfied so far with them. Love these tires! They are noisy, but the traction is worth it. Even though they're rated for 50,000 miles I've gotten over 60,000 so far with still a little meat left. These are excellent tires and they meet my demands in the muddy, dirty roads and trails when called upon. Excellent choice! Great tires. Would purchase again.